An event management platform, capable for handing events of any type and scale. The Events application covers all aspects of an event planner, from organizing the event and selling tickets to visibility and promotion. Add a presenter proposal form to your event page to allow visitors to submit talks and speaker nominations. 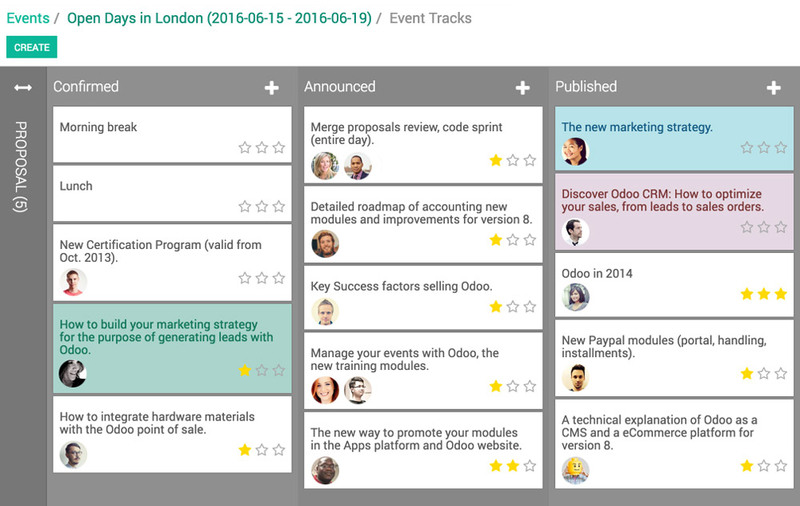 Organize the validation process or presentation of each event and schedule them in minutes. Automatically show your event calendar directly on your website with a clean and polished design. Enable your visitors to search easily, browse your published events, and quickly filter by date, location, tags, and speech. Manage event registration and the tickets sales online. Choose whether to publish a free event or have your attendees purchase tickets through the event page. Choose the method of payment, with online credit card or customer invoice. Set special conditions, such as anticipating the price of tickets, perks member benefits or multiple ticket tiers. All you need to increase your event attendance and manage your guest list from one place. Promote events efficiently across all channels. Segment your audience and enjoy networks to promote your events to the right audience. Set up automated campaigns for all attendees, or customize content specific registrant types or segments. Optimize conversations with ad-hoc landing pages for your different marketing campaigns. Monitor the analysis of events at each stage of process. The integration of Odoo with Google Analytics is automatically configured to locate via online cart, online check out, call-to-actions, etc. Increases visibility and attracts more participants. SEO tools are available directly on Odoo, with no configuration required. Keyword suggestion based on the most searched terms on Google, allowing you to structure your content and promote your events. Sell sponsorship events and promote your partners. Easily manage existing and new sponsors with the Events application. Add sponsors to your events and publish them based on the level of sponsorship they buy at the bottom of each event page. Get an incredible, totally customizable business website. Easily create invoices from existing transactions in the Point of Sale application for Accounting. Capture leads through your event page and minimize your sale cycle.